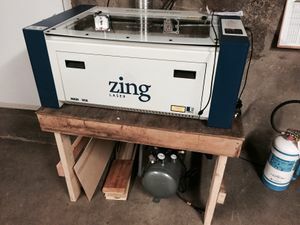 The Zing 24 is a laser engraving machine capable of laser cutting and engraving stock up to 12"x24". 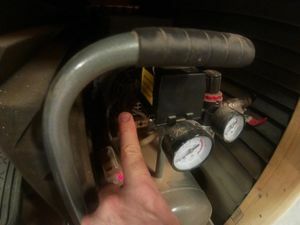 This page is meant as a resource to help with the Epilog Zing 24 usage as it's set up at Ithaca Generator. 11.1 Why are there so many small fires starting? 11.2 Why is taking so many tries to cut my material? 11.3 Why does my engraving look so blotchy/bad/etc.? After making sure the material you are engraving or cutting is on the approved materials list, place your stock material onto the bed, making sure it's as flat as possible. The ventilation fan should always be on. It's in the shop labeled "Fan" with blue tape holding it on. Sending jobs to the Epilog Zing 24 laser cutter can be done by opening a PDF from the attached computer and hitting "Print". 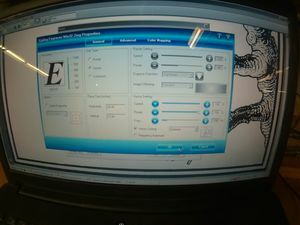 The Epilog Zing 24 has it's own print driver and the different options for speed, power, vector, raster, etc. can be set in the "Properties" section in the "Print" popup. Inkskape cannot reliably print to the Zing. Save your job as .pdf and print it from Adobe Reader. Vector lines that have a width of .001" (1/1000 of an inch or 1 mil) is used as an indicator that the line is to be cut by the laser cutter. Other lines and images are interpreted by the Epilog Zing 24 driver as a raster image suitable for engraving. After hitting "Print" from the laptop attached to the Epilog Zing 24, the job should appear on the console display on the Epilog Zing 24. Press the green "OK" button to start the job. Never leave a running job unattended. The laser cutter is burning and vaporizing material that can lead to uncontrolled fires starting. A fire is much more likely to go out of control if the laser cutter is unattended. When you are finished, empty out any cut pieces from below the grid box. The entire box should be pulled straight up and its contents emptied into the trash. They are a fire hazard. There is a power switch to the bottom right of the Epilog Zing 24. To activate the Epilog Zing 24, flip the power button up. After an initial boot sequence and carriage calibration, the Epilog Zing 24 will be ready to receive jobs. After generating your piece in whatever software package you like, convert it to PDF. Lines in the resulting PDF that are 0.001 inches (0.001" or 1 mil) will be interpreted as cuts by the Epilog Zing 24. Anything else will be interpreted as raster. There is a network drive called "Firefly" that can be used to make files available to the laptop connected to the Epilog Zing 24. Alternatively, either connecting to a remote server and downloading the desired file or using a USB stick to transfer the files locally can be used. Place the stock material that is meant to be cut or engraved on the bed, making sure it's as flat as possible. For favorable cuts and engravings, the bed height should be adjusted so that the beam hits the material at the optimal position. The height of the bed can be adjusted by putting the Epilog Zing 24 into "X/Y" mode and pressing the up and down arrow keys. There is a small spring loaded metal arm attached to the carriage near the final mirror assembly. Disengaging one side of this arm and make sure it touches the work with a small amount of tension in the small spring loaded arm. Once satisfied with the height, reposition the carriage to the home position, using the laser pointer to help with proper positioning. The laser pointer can be activated by the "Pointer" button on the Epilog Zing 24 console. After the PDF file has been generated and made available on the laptop connected to the Epilog Zing 24, it can be opened with a PDF viewer. By default, double clicking on your file will open the PDF viewer. After reviewing your PDF, hit "Print". Before confirming the print, hit the "Properties" button and review the Epilog Zing 24 settings. Speed and laser power can be set for both vector (cuts) and raster (engraving). Different material will cut at different speeds and powers so some experimentation might be required to find the right speed and power. Once satisfied with the file and properties, hit the "Print" button to send the file to the Epilog Zing 24. The Epilog Zing 24 will retrieve the file with it's "data" light blinking while it's processing the file. Once the file has been uploaded to the Epilog Zing 24 laser cutter, the job name will be shown on the LCD display. Hit the green OK button on the Epilog Zing 24 to start the job. 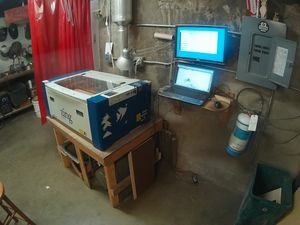 Make sure the ventilation is on by turning on the air compressor located under the Epilog Zing 24. Configure the laser cutter speed and power in the "Properties" page after selecting "Print"
Never leave the laser cutter unattended while a job is being processed. Unattended jobs run the risk of having an uncontrolled fire break out. If there is a file that has both raster and vector elements but only one or the other is desired, there is an option in the "Properties" page off of the "Print" page that can be used to select only raster or vector elements. After the option to restrict to only raster (engraved) or vector (cutting) has been set, the rest of the process is identical to sending a normal job to the Epilog Zing 24 for processing. Often small fires can break out that give the operator some time to react. If a small fire breaks out, try 'tapping' it with your hand to put it out. Lifting the lid of the Epilog Zing 24 will disengage the laser so there is no worry that you will be interacting with the material on the bed while the laser is running. While a job is being processed the running job can be paused by hitting the red "Stop" button on the Epilog Zing 24's console. Without first pausing the job by hitting the "Stop" button, the carriage could still be moving so caution should be used if the small fire needs to be put out before the job can be paused. 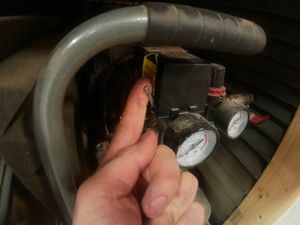 If the laser cutter is being attended to while a job is processing, most fires that do occur can be reacted to and put out with minimal effort. In the case of a catastrophic runaway fire, there is a fire extinguisher located to the right of the Epilog Zing 24. Machinery can be replaced, humans can't be. In case of emergency, choose safety of yourself and others over trying to salvage machines. When the job is completed, turn off the compressor and turn of the Epilog Zing 24. 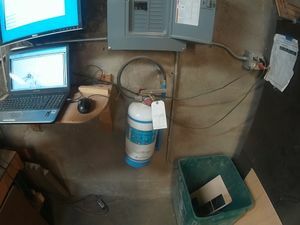 In general, keeping the laptop powered on and ready for use is a good idea. Why are there so many small fires starting? This might happen for a variety of reasons. 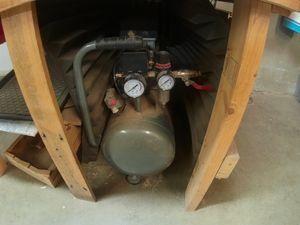 The first thing to check is that the ventilation is functioning and the air compressor is turned on when the job is processing. Another thing to check is to make sure the power and speed settings are appropriately set in the "Config" page off of the "Print" page. Setting the speed higher or setting the power lower (or both) might help mitigate small fires from starting. Why is taking so many tries to cut my material? If you think the material is thin enough to be cut by the laser cutter but for some reason it isn't managing to cut through, there are a few things to try. Is the material laying flat on the bed? Has the height of the bed been adjusted properly for the work? Are the power and speed settings set appropriately? Why does my engraving look so blotchy/bad/etc.? This could happen for a variety of reasons but some things to check are if the bed has been adjusted to the proper height and that the power and speed settings are set appropriately. If this is happening to you, try turning the Epilog Zing 24 off and on again, waiting for it to finish it's startup process and then resending the file ("Printing" the file). Wait for the file to be transferred completely over by waiting for the "data" light to stop blinking on the Epilog Zing 24's conosle. Once the data has been completely transferred and the data line inidactor light has stopped blinking, make sure the job shows up on the Epilog Zing 24's display and hit "OK". If the problem persists, please inform the members in charge of the Epilog Zing 24's maintenance. Make sure the lines in your PDF have width 0.001 inches. Anything larger than that will be interprted by the Epilog Zing 24 as a candidate for engraving. This page was last modified on 9 April 2019, at 11:59.